TripView is sort of multi-modal — you can save multiple searches into a single trip (e.g. train from A to B and then a bus from B to C) and then “A to C” becomes a single trip that one need only consult once. Adrian from TripGo here. Thanks for the review! Always happy about constructive criticism. FYI: The “locations are too far apart” pops up when you try to do cross-city routing like Sydney to Melbourne which are routing engine doesn’t handle yet due to lack of flights and intercity train data. We are looking into the bug that airport surcharge isn’t correctly applied. Lastly, parking data and suggestions is something we are keen on improving. At the moment we rather give some odd multi-modal results rather than missing other sensible park-and-ride options; it’s a touch balance to nail automatically as you can imagine. The trip that gave me the “locations are too far apart” message was entirely within Sydney’s Eastern Suburbs (Coogee to Little Bay). 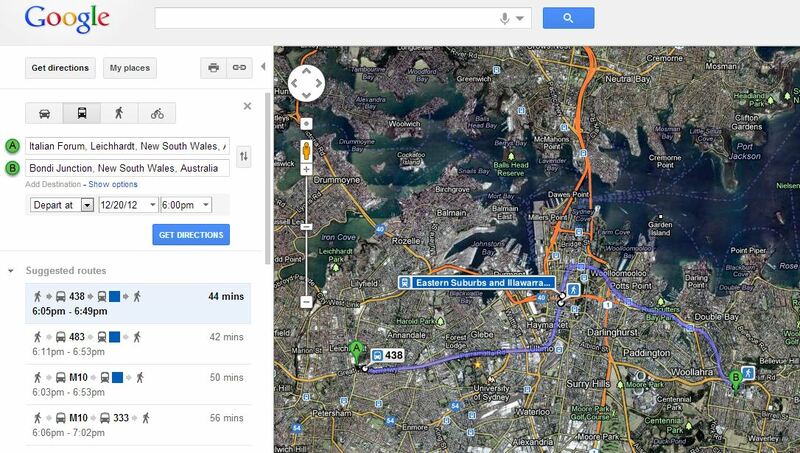 As for trips involving parking, Cityrail does provide information on which stations have park and ride facilities. 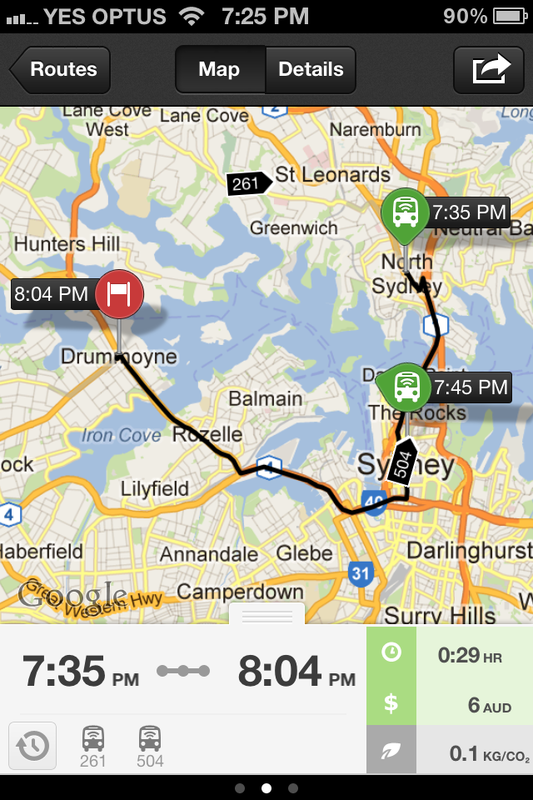 As far as I know, none of the transport apps out there currently incorporate that information. Always good to see another service for commuters out there. I’m sure you’ll get the kinks and teething issues worked out in due time. I look forward to seeing how it goes! Have you seen the official Transport Info app? 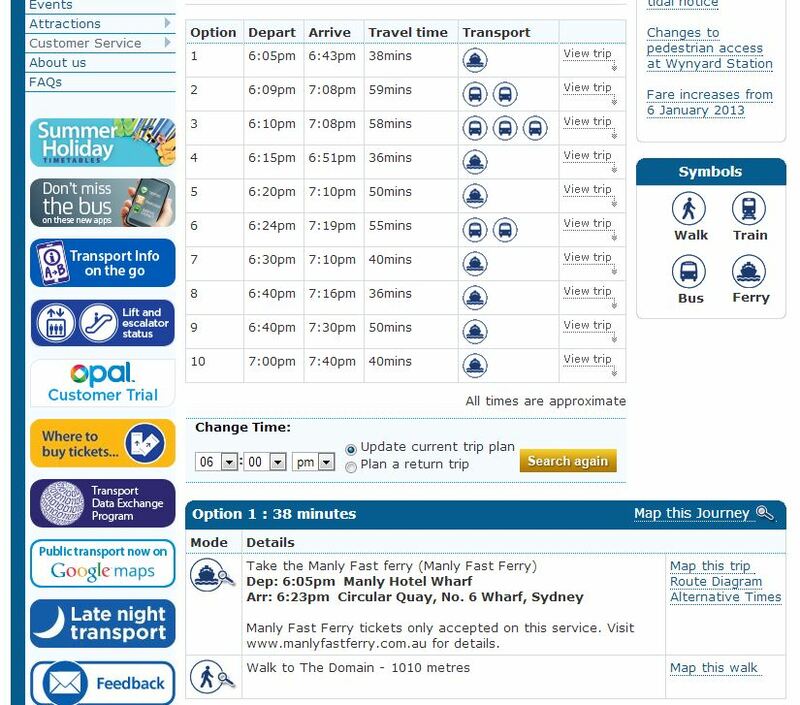 (http://www.131500.com.au/plan-your-trip/Info-on-the-go/transport-info-app). It does include real-time info on buses, supports multi-modal and allows you to select locations (current location, address, etc.) rather making you select a particular transit stop. This makes it the best app for my purposes. However the problem I have with all the apps is that the actual location data is rubbish! A large percentage of the buses don’t seem to be registered. I regularly see buses come by which haven’t been listed, and then there are sometimes “phantom” buses which are 5 minutes away, 3 minutes away, 1 minute away, then disappear (my guess is that these buses are reporting the wrong bus number). Of course this isn’t the fault of the apps, but until the GPS is working on all buses, and the data is accurately reported, I find the apps to be close to useless. If you bump into such phantom buses, it’d be helpful if you send send details to the app developers. They can then work with the transport department to figure out what caused the bad data. So if I have some kind of trick question, like how to get from Roseville to Kellyville, then I am going to be pondering this question some time before I leave, and real-time information about where the buses are “now” is going to be irrelevant and useless. There are about 6 different ways to get from Roseville to Kellyville, and which one is best, depends on when you are going.